The tool is suitable to convert and save multiple Mozilla Thunderbird MAB files including impab.mab, history.mab & abook.mab files to PST, CSV & vCard format. 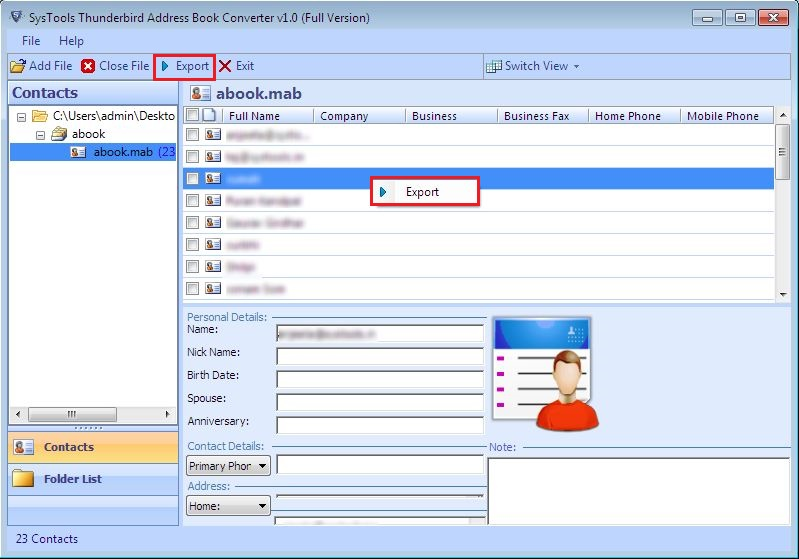 MAB Converter Facilitates the preview of all contact details with images and attachments. MAB converter Tool facilitate to transfer the .mab file to CSV format in a complacent way. Tool migrate all type of MAB files to CSV format, including history.mab (Collected Address Book) file & abook.mab (Personal Address Book) file. Besides, after conversion of MAB to CSV, user can access it with any CSV supported applications e.g Excel. The MAB to vCard converter offers the user to transfer MAB file to vCard or VCF file format. 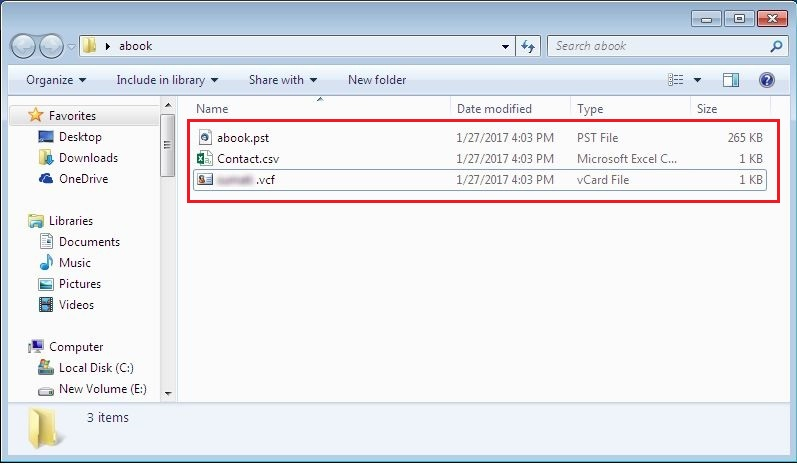 After exporting Thunderbird Address Book to vCard format, a user can also preview converted file in an original format. The user can also open these vCard contact books in any of the vCard (.vcf file) supported application such as MS Outlook, Lotus Notes etc. The user does not require to install the MS Outlook in the machine, while the exporting Mozilla Thunderbird Address Book (MAB files) to PST format. 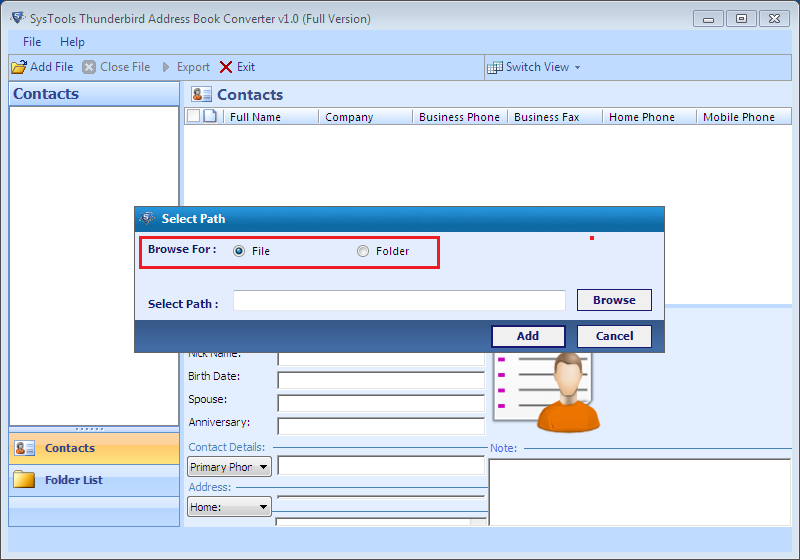 The Address Book Converter works with or without Outlook installation. MAB converter easily convert MAB to PST (Thunderbird contacts to Outlook Exporter). It exports all three Mozilla address book i.e. 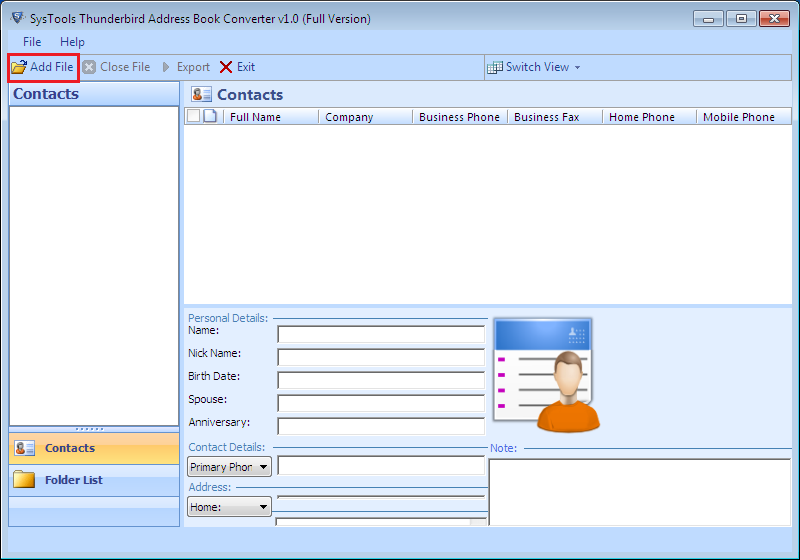 Personal Address Book, Collected Address Book & any imported Address Book to PST file format. 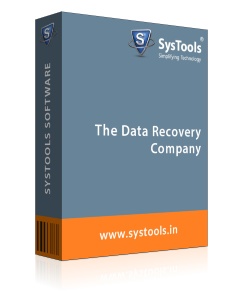 Moreover, this tool is supported in all MS Windows versions. File Option to transfer a single MAB to CSV, PST & other file formats. 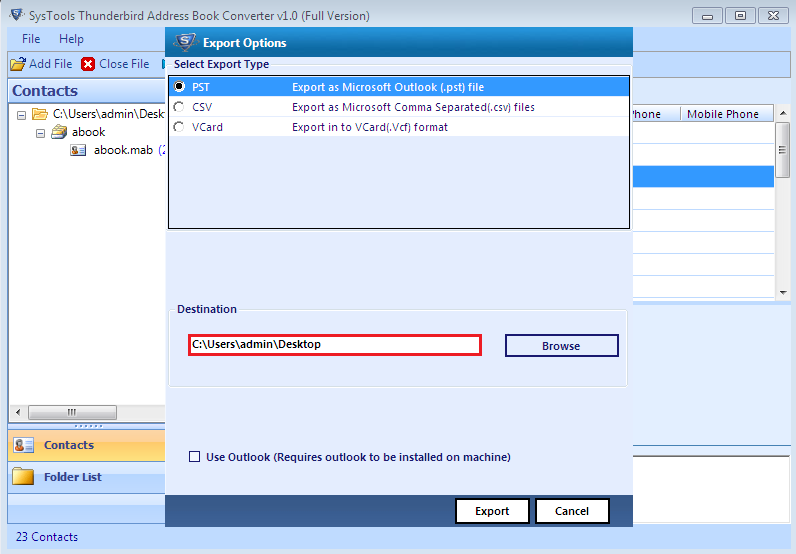 Folder Option to bulk migration of MAB to vCard, VCF etc. Thunderbird Address Book Exporter creates a migration report after the process of MAB to vCard and user can also save the report as CSV format. This conversion report can be accessed by users & also can be viewed in Excel or any other CSV supportable applications. After selecting the MAB file, the MAB Converter gives you an effortless option to preview all the contact details with attachments. The user can also have the option to sort the contacts according to provided an option like Full Name, Company Name, Mobile Phone etc. How to Convert Mozilla Address Book Files? Step 1 : Download & Install Thunderbird Address Book Converter. Folder Option - This option helps to export multiple MAB files to PST & another file formats supported by tool. Step 3 : Select Export to Transfer MAB file data. Step 4 : Conveniently completion of Export MAB file Select the destination File Folder after the completion of MAB Conversion. Now, click on the Export option to complete the conversion process. You can easily view the converted file from the storage location that you have browsed previously. Q. Is it possible to convert my Mozilla Address Book contacts to PST format without Outlook installation in system? Ans: Yes, You can export all your MAB files to PST format without installation of MS Outlook in your system. Q. As MAB exporter software transfer MAB to CSV, PST & other file formats. Is there any chance of converted MAB file data corruption? Ans: No, there is no chance of data corruption in Thunderbird Address book conversion. The MAB file Converter also retains the attributes. Q. Whether this software can run on Microsoft Windows 8 OS? Ans: Yes, you can easily excute MAB Converter software on any version of the Microsoft Windows OS, including Windows 8 & Windows 10. Q. Can I convert MAB to VCF using this software? Ans: Yes, the user can easily convert MAB to VCF or vCard using this application. Therefore, user can choose any of the file option to transfer MAB file of Thunderbird into vCard. Q. Does MAB Converter Tool have any file size restriction? Ans: No, Thunderbird Address book Converter Software does not have any file size restrictions, the user can export and view MAB file of any size to another address book without any limitations. Note: Thunderbird Address Book Converter Software will get delivered on your registered email id, within few minutes after placing the order. I am using Thunderbird at my home place and MS Outlook at work place. Therefore, some times it becomes really urgent for me to access Thunderbird Address book in Office also. Thanks to MAB to PST converter for solving my problem in such a great way. I must say that great effort was done by the development team of the software. I am searching for MAB to PST Converter for a long time as I have received a MAB file through email and using Outlook on my local machine. After some time one of my friends suggested me to use MAB Converter. It is an amazing and easy-to-use utility such that even a non-technical user like me can also use without any hassle.